Nathan Hill checks out this alternative to having your tank drilled - and a PFK reader gets to give it a try! The biggest hindrance to getting a sump has always been those pesky holes. It’s a real obstacle if you don’t have the tank drilled. There are a few overflow boxes on the market and this model looks a good one. This SOB-02 is rated up to a flow rate of 5,000 lph and comes with two 38mm outlet pipes for rigid fixtures. Able to hang on to the edge of the aquarium and fit over panes of up to 35mm thick, the unit is primed by pulling the air out of the central partition using the 'vent' on top. Then, once filled with water, a syphon principle takes hold, pulling water from one side to the other and then overflowing it into the two outlets. There’s a removable comb structure to stop fish being pulled in to the workings or trying to hide inside it. It’s a sizeable brute, measuring almost 24 x 20 x 26cm/ 9.5 x 8 x 10”, but it’s sturdy and you don’t feel it’ll crack or spring a leak any time soon. "I was first struck by its size and once you get hold of it you notice how well made it is. "The problem was with having so few instructions. They were vague at best but, being fairly astute, I managed to get the thing set up. "It was a bit of a faff getting the air out to start the syphon effect and I actually ran a long piece of air line and connected it to my skimmer, saving me from a mouthful of seawater. "I was pleasantly surprised at its quietness – very inconspicuous. Having it running for three weeks, aside some minor algae build-up inside, it’s been fantastic. 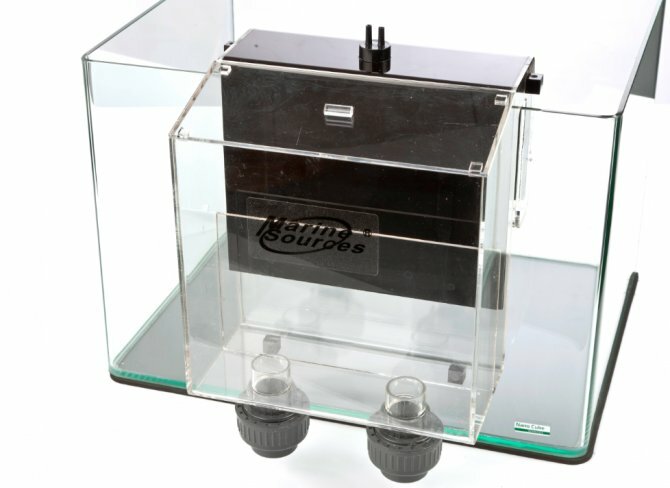 "If you don’t want to drill for a sump then this will fit the bill. As long as you don’t mind filling in the blanks with the instructions you’ll have a solid piece of kit." It does what it’s designed to do and saves a lot of bother in draining and drilling a tank. If you want to up your game and feel you’d be liberated by a sump then get one. You’ll not regret it. Price: £79.99. Available from All Pond Solutions.